Welcome to Day #4 of Chocolate and Costa Rica Theme Week. 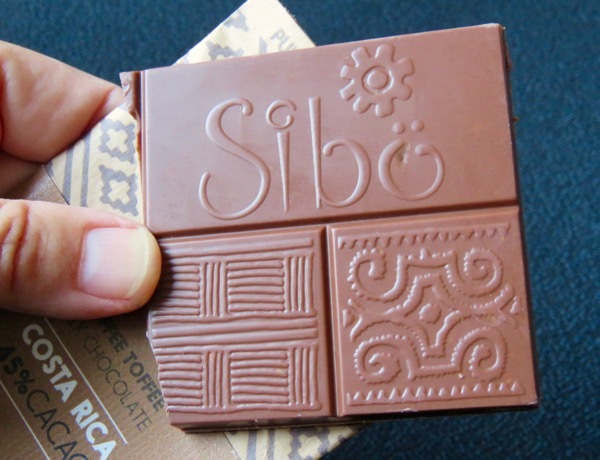 Today's Costa Rica 45% Cacao Coffee Toffee Milk Chocolate bar from Sibu Chocolate (San Isidro, Heredia, Costa Rica) was made in Costa Rica with Rainforest Alliance Certified Cacao grown on a single estate in Limon Province. 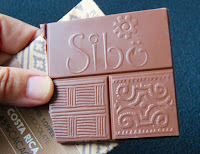 It was the second of four Sibu single origin bars that will be featured this week. 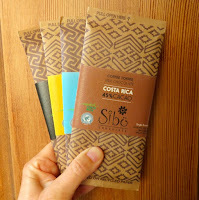 Lighter in color, this 45% cacao bar contained a pleasingly complex blend of aroma and flavor notes: sweet, slightly fermented cacao and milk, and very light coffee and caramel. Buttery, crunchy toffee bits were interspersed throughout the bar.